Our Mystery of the Ancients: Deadly Cold Walkthrough will keep the cold from setting in completely as you attempt to discover who is responsible for the sudden turn in temperature and the kidnapping of your dear friend, Kira, in the town of Baumholder. Trust in our simple puzzle solutions, our custom marked screenshots, and our detailing gaming instructions to see you through this chilling hidden object adventure game! Welcome to our Mystery of the Ancients: Deadly Cold Walkthrough where you'll find all the resources you'll need to battle the deadly cold that has been set upon the city of Baumholder. Our custom marked screenshots, detailed game instructions and puzzle solutions will carefully and successfully guide you through this chilling hidden object adventure game! 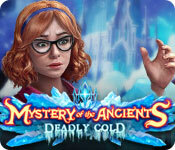 We hope you enjoy our Mystery of the Ancients: Deadly Cold Walkthrough! In Mystery of the Ancients: Deadly Cold, it's been too long since you've seen your best friend Kira, so of course you jumped at the chance to visit after she invites you to scenic Baumholder for the weekend. You've barely arrived and met her new husband Victor when a freak blizzard sets in, ruining a perfect summer day. When a dark tower of ice rises from the city square, ice giants rain down on the streets, freezing everyone and everything in their path. Who is controlling them and what do they want? Work together with Victor to save Kira and survive the deadly cold.